On Sunday, July 2nd, 2006, Rev. Tony Ponticello addressed the congregation at the Community Miracles Center in San Francisco, CA. What follows is a lightly edited transcription of that lecture. It was a smaller than regular gathering as many members were busy with holiday traveling and events. However the CMC’s joining and service continued at the regular time like always. Happy Fourth of July weekend. The fourth is on Tuesday so many have a long weekend to celebrate. Every fourth of July weekend I like to remember that we’re right at the middle of the year. It’s the first weekend of the second half of the year. We’re half way through the year. It’s a good time to look at our goals and resolutions that we set in January. I gave several lectures about that. I looked at mine this morning. It was rather depressing, but I read them again. It isn’t whether you achieve your goals, it’s whether you do your best and are in pursuit of them. It’s a good time to take stock of this year. Let’s think about what the year is supposed to be about. Most of you noticed many boxes back by the piano. That is a mailing that we are doing to 8,280 people. It’s the entire USA list of A Course In Miracles (ACIM) students gathered for many years by The Circle of Atonement, which is Robert Perry’s organization, in Sedona, Arizona. It’s announcing the conference which is coming up in February of 2007 and it has a personal letter from Robert Perry in it strongly encouraging people to come to the conference. Yesterday, Rev. Larry, Robert Howard and eight workers labored for twelve hours to put this mailing together. I think Rev. Larry, especially, deserves a round of applause for working so hard (People applaud and say “Yea, Larry!”) and organizing that work. Literally, from nine in the morning till nine in the evening, he was working with everyone. It was a huge job; 8,280 pieces had to be assembled. There were two things in each envelope. The letters had to be folded. Every piece needed to be stuffed and labeled. It was huge. Over eight thousand people will know about the conference now and read a letter encouraging them to come. Another milestone is we now have 301 people registered for that conference. ** We broke the 300 mark and 300 was the goal we set to have registered by this time. This is actually just the early enrollment period. We now have 301 registered and we probably have gotten 80 of them within the past month. The most we can hold in February is 600, so we’re halfway to that goal. We have this big mailing going out and the major publicity starts now. Up to this point it has been mostly email publicity. Now is when all the printed publicity starts to get distributed. I want everybody to keep visualizing 600. That’s what we want to see in The Holiday Inn. This is a great start. This solid 300 creates an energy that draws more people to it. We now have 300 people who believe that this conference is well worth their money and time to attend. It’s well worth their effort to get to and that thought will increase because more and more people are sharing it. I’m getting very excited about it. The thought of getting together with 600 A Course In Miracles students for three days and listening to all those teachers – being with everybody, having fun together, learning together in that fun atmosphere – I think the planet’s going to take right off. I’m jazzed that we met our enrollment goal. It’s an amazing thing and I am grateful. Returning to the idea that thoughts increase by being given away, I want to again acknowledge Rev. Larry because he is giving away the ideas and thoughts that are in the Jesus’ Course In Miracles (JCIM) by recording them. I, now, have them loaded on my iPod and I’ve been listening to tracks from the JCIM as I walk back and forth to work. They are amazing! They are communicating something to me profound and significant. As I’ve said before, the great thing about Rev. Larry’s reading is the dramatic feeling and depth of understanding he is putting into it. It’s very different than the recorded A Course In Miracles that we’ve had for many years. Rev. Larry is reading it with great comprehension and feeling. He’s reading it in a way that makes us truly understand the words. The meaning sinks in. He’s actually communicating what the words are saying. The recording of ACIM that has existed for many years is very professionally read but I don’t think the person who read it had the slightest clue what he was actually reading. He seems like a professional reader who knows how to read words. It’s a very competent reading by someone who doesn’t seem to have a true connection with what he’s reading. It’s the old idea of having the form be good but with no content. Rev. Larry’s reading of the JCIM not only has great form but also great content as well. It is sinking into my consciousness. I find it amazing,. “Thank You.” (Directed to Rev. Larry who is in the back of the meeting room.) I continue to listen to it. A Course in Miracles tells us this about form and content and this was in the reading that Rev. Beatrice did before the sermon. When we listen to a communication like Rev. Larry is doing in this recording, it comes in. The meaning of the words and the thoughts come in. True communication is happening. It is certainly happening to me. I’ve benefited from listening to it. Rev. Beatrice was talking to me in the office the other day and she commented that I was in a very good mood. “Yes, ...” I said. “I’m strangely optimistic.” I have a optimism which, on the surface seems irrational because a lot of things don’t seem to be going great. It doesn’t matter. I’m looking beyond the form to the content underneath it that is communicating to me things are just perfect and going along well. I’m grateful that I have been able to rise above these forms and go to the content. I get the communication there in the content without getting stuck in the form. Listening to Rev. Larry’s recording of the Jesus’ Course In Miracles is helping me do this. This is what the body is for. The body is for communication but we have to, of course, choose what we’re communicating,. Are we communicating the ego or are we communicating the Holy Spirit? The Holy Spirit will always use our body to communicate meaningful concepts and meaningful ideas. That’s the only use the Holy Spirit has for the body. It’s important for me to remember this. We do have a function here. We’re here to communicate truth, love, peace and comfort to our many brothers and sisters because those are the things that we want to have communicated back to us. I’m feeling that, these days at the halfway point of the year. Regardless of what seems to be going on, at the surface, I’m hearing that communication coming from the Holy Spirit to me in so many ways. Most of you know – maybe some have forgotten – this was written by Thomas Jefferson. He’s generally considered the author of the Declaration Of Independence. I did a little research this morning. Jefferson wrote the Declaration between June 11 and June 28 in 1776. That means it took him 17 days to write 1,336 words, which isn’t really that much writing. He was being very precise with every word. The first phrase, “We hold these truths to be self evident ...”, as I’ve said, we always attribute to Thomas Jefferson but the truth is Thomas Jefferson wrote, “We hold these truths to be sacred and undeniable.” That is what Jefferson wrote, but it was Ben Franklin who convinced Jefferson and the others not to use, “sacred and undeniable” but to substitute “self evident.” So, that “self evident” phrase that we think was written by Thomas Jefferson was actually contributed by Ben Franklin. There are many wonderful ideas expressed here. I love the “self evident” idea because it means it’s obvious to the self. The self has wisdom and connection to knowledge. It’s obvious. It doesn’t go into proving these ideas. It assumes that everyone has connection to the same truth and if they just look within, it’s going to be evident. This is an idea that is mirrored very well in the A Course In Miracles. We all have the truth inside of us and all we have to do is look within. The Course isn’t here to teach us any of those truths – that we are love and eternal. These ideas, if we just remove the blocks to them, will be self evident. They are self evident. I believe the Declaration Of Independence and ACIM are meshing with many spiritual principles. Also, we have this idea that all men are created equal. All people are equal. It is sometimes argued that in the time when Thomas Jefferson was writing this, he truly meant “men”, as in males. He didn’t mean “men and women” because men had much higher stature in society at that time than woman, who could barely own property. What did Jefferson, Franklin and the others mean? Some say, “men” only meant Caucasian males. African American males certainly did not have equal rights. They didn’t have equality. 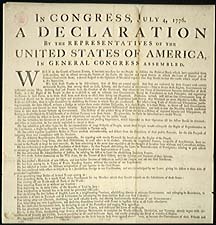 If ‘men” were just Caucasian males, one might wonder what African American males actually were in the eyes of the writers of the Declaration Of Independence. However, I don’t know if I agree with this argument. I think Thomas Jefferson, Ben Franklin and the others were aspiring to higher ideals. What seems evident to me is they did mean all people, all men in the inclusive sense. They knew this ideal had not realized itself yet in the population but they were planting the seeds for it. They were planting seeds for African Americans, Hispanics, Asians, Pacific Islanders and females, all joining that equality. They were saying it was so, even if it hadn’t manifested yet. On a surface level they meant that the people of the American colonies were equal to the citizens who mird on the British Isles. Americans were equal and they shouldn’t be subject to laws that didn’t have any bearing on them or made by people who didn’t mir in the colonies. However, I think they were planting seeds. I believe that inside of them, they knew what they were saying and meaning. Here, at the Community Miracles Center we also have been good at planting seeds. We aspire to high ideals. Sometimes it doesn’t seem like those high ideals have materialized. What is self evident to me is that it doesn’t matter. We still know these high ideals are the truth. It is still important to plant the seeds. In the year 2000, we hosted our first large conference. Rev. Larry and I, and everyone else who worked on that conference, planted the seeds that different A Course In Miracles organizations, different ACIM organizations which believed in different things, could join together to do something beautiful and something important. We promoted this idea to several other organizations. We were able to find others to join with us to put on a joint conference. It was unheard of at the time. There had been conferences, there still are conferences, but these conferences were put on by specific individual organizations. The conferences didn’t spring from a joining of organizations. Whatever financial benefits might have been generated went to the specific organization which put on the conference. Rev. Larry and I devised a method of profit sharing which made it a win / win for everybody concerned and we made sure that these conferences would come from a true joining. This is now the fourth, such, conference. It’s returning home, where it originated, to San Francisco. Now there are nine organizations that are joining together to do this, sharing this idea, this vision. Again these aren’t organizations which always get along. There are organizations in the mix which do not get along. They don’t believe in the same thing. Some may have been critical of each other. However, they are putting those different opinions aside and joining together. It’s so wonderful and it is the idea which we, the Community Miracles Center have championed. We planted that seed; slowly it grows. Just like Thomas Jefferson and Benjamin Franklin planted the seeds for a country where all men were created equal. It didn’t materialize in their time but slowly it continues to grow to be. There are organizations we asked to join us for the conference but they did not join us because they didn’t share our joining ideal. They saw things differently. They didn’t want to join with organizations, or speakers, which they felt uncomfortable with. They did not want their names associated with sponsoring certain speakers because .... whatever. Perhaps they just weren’t comfortable being part of something they could not control. To me, it feels like the thought of separation and division. I work on forgiving my perceptions. We trust that they followed their best guidance. We trust they are doing what is right for them. We’re sorry that they won’t be playing with us. Maybe next time. Right now we’re half way to the conference in February, half way to this historic joining. We’re done with the early enrollment. We are in the major enrollment and publicity phase. We have half the enrollment we want to have. Those energies of separation and division are still here though and frequently within the ones who have agreed to take part. We get communications from people who are involved hinting that certain ones should not be a part of this coalition because of ... this, that and the other thing. It just goes on and on. It’s amazing to watch this all take place. However, we’re sticking to the ideal, the seed that we planted. You ask everyone you know. It’s their choice, of course, whether they want to do it or not, but you ask everyone and then they can choose. I want to be one of the chosen ones. We want Community Miracles Center to be one of the chosen ones. We want it to stand for self evident truths that all A Course In Miracles teachers, are created equal and all ACIM organizations are equal. They all have an equal right to be at the table. You don’t have to agree with them but you can honor who they are and honor them for showing up. What we are doing and what we are helping to create here is truly miraculous. We have to acknowledge those unalienable rights that were given to us by our Creator. We have to acknowledge that we were created, that we were authored. Somebody else wrote the definition of what we are. We surrender into that. If we don’t, we’ll have fear. Of course, The Declaration Of Independence listed what it considered to be the unalienable rights, “... Life, Liberty and the pursuit of happiness.” I have always appreciated how they wrote, “... the pursuit of happiness.” It’s the journey to happiness, the pursuit. We probably never have true happiness here. A Course In Miracles tells us the same thing, but we can pursue happiness. We can move in the direction of it. It’s probably never going to be perfect here. The Course tells us that. However, what can be perfect is our journey. On our journey to happiness and peace we can have a perfect journey. We can embrace our mirs. We can embrace our liberty and we can embrace our journey. No one can deny us those rights because that’s how we were created. This is aligned with all that I am learning from ACIM. Let’s have a little history about Thomas Jefferson. He was 33 years old when he wrote the Declaration Of Independence. He served as our ambassador to France. He sympathized with the French revolution. He got a lot of architectural and engineering design ideas when he was over in France. He used many of these ideas when he helped design Washington DC, or nation’s brand new capital which explains a lot of the French classic design – it came from France’s great buildings and monuments. He also served as governor of Virginia. In 1796 he ran for President and lost to John Adams. In those years the candidate who lost became Vice President so he became Vice President for John Adams who he despised. They never spoke once during their tenure in office. However, in 1801 he ran for President again and this time he was elected and he served two full terms. He championed the twelfth amendment which changed the way Vice Presidents were elected. After that no Vice President would have to serve for a President with such ideological differences the way he had to serve for John Adams. He formed what was then called the “Democratic Republican” party in 1792. He became the first President elected from the Democratic Republican party and that party is the Democratic party that we still have today. Our modern Republican party wasn’t formed until 1854. He negotiated the Louisiana purchase for 20 million dollars from Napoleon and the French. He purchased that huge tract of land which would soon become part of the United States, just about doubling the size of our young nation. He commissioned the Lewis and Clark expedition that was to map this new land. This expedition firmly established future peaceful and scientific goals for the US military. He founded the University of Virginia which he considered one of his crowning achievements towards the end of his life. Also near the end of his life he donated his vast personal library to the US government and this became the start of the Library of Congress. He was quite an influence for our new country. In an interesting bit of synchronicity, Thomas Jefferson died 50 years to the day of the signing of the Declaration Of Independence on July 4, 1826. We celebrate this signing two days from now. I’m glad to be able to address you today and make some of these statements because, hopefully, it will get us in the proper frame of mind to appreciate the fourth of July. By writing the Declaration and putting forth their ideals they were putting the word on paper. The Bible tells us, “In the beginning was the Word and the Word was with God, and the Word was God.” (John 1.1) The words were the seeds. They are what comes in the beginning. Thomas Jefferson and our founding fathers planted the seeds. They started this country by writing and signing the Declaration Of Independence – putting the word out. They told the world what they stood for so many years ago on July fourth, 1776. The Community Miracles Center is also planting seeds. Rev. Larry’s voice and reading of Jesus’ Course In Miracles, those are seeds for greater accessibility to the original thoughts of the Course. Those are seeds for greater understanding of the healing truths found in the Course. Those 8,280 pieces of mail that we are going to send out, those are seeds to A Course In Miracles students, alerting them to the incredible joining that will be happening here in San Francisco in February next year. The conference that we hosted in 2000 was a seed. It planted the idea in people’s minds that A Course In Miracles organizations could actually come together. Maybe we have much more in common than we have separating us. We could come together in greatness. The 301 people who have already enrolled are the seeds of the 600 students that will hopefully converge at The Holiday Inn next February. Those of us here today are seeds for a future of the Community Miracles Center and all the good healing work that we will do. We’re not at the goal yet. We’re in pursuit of the goal. We’re in pursuit of our happiness. We’re in pursuit of our ideas. Maybe we’re half way to the goal. Maybe our country is half way to the goals our founding fathers set for us on that fourth of July in 1776. Think about the signing of the Declaration Of Independence. That was a joining of 13 original colonies. They were separate entities. They were not joined in any political association, not until 1774 when the Articles of Association were signed. Isn’t it interesting that we do not celebrate that signing. Two years later, the 13 colonies joined in the word, around wonderfully written ideals. 56 representatives from the 13 former colonies, soon to be states, signed the document and made it powerful by their energy of joining. That’s the date we celebrate as the birth of the nation. Those colonies had many differences and many different ideals. They would retain some of the differences, as part of their identities as states. However they also shared ideals and so they could now share a common identity, the United States of America. We are all in the pursuit of happiness however we define it for ourselves, whatever self evident way it reveals itself to us. Let us realize what is going on two days from now and get into the energy of joining and stating our word together. The country was founded by a joining around wonderful spiritual principles beautifully written and clearly stated. These principles are mirrored in the spiritual discipline A Course In Miracles. We haven’t realized all the principles yet, but we’re in active pursuit of them. The seeds were planted a long time ago. We’re half way to the fourth of July. We’re half way to the ideals set forth in the Declaration Of Independence. This article appeared in the July 2006 (Vol. 20 No. 05) issue of Miracles Monthly. Miracles Monthly is published by Community Miracles Center in San Francisco, CA. CMC is supported solely by people just like you who: become CMC Supporting Members, Give Donations and Purchase Books and Products through us.